The Eagle Scout designation is highly respected because only 4 percent of all Boy Scouts are ever granted this prestigious rank after fulfilling the many years of requirements that must be achieved. On Saturday, January 5th, twelve African American young men reached the ultimate milestone of being awarded the Eagle Scout distinction. “This event marks a tremendous milestone in the history of our troop,” said Scoutmaster Crook. 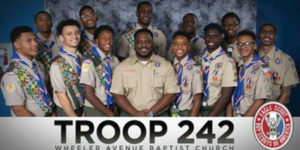 Twelve Eagles at one time is pretty much unheard of for any troop and definitely for an African American troop like Troop 242. All 12 of these young men have had their “eye on Eagle” through years of hard work, fulfilling their obligations with more than just the minimum obligations required for the honor to be called an Eagle Scout.